Get continuous feedback from client stakeholders in a structured and easy way. 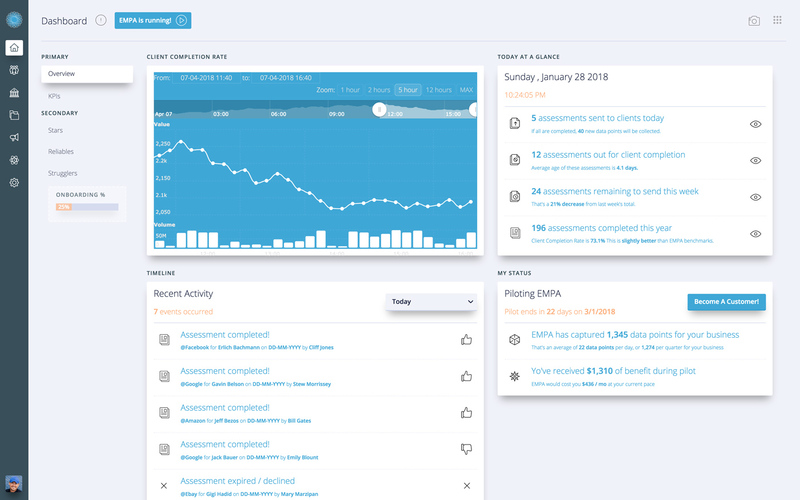 EMPA takes the pain out of collecting and analyzing consultant performance feedback during projects so your teams can deliver the best possible experience for every client. Pilot EMPA With Your Team! EMPA eliminates friction between consulting delivery teams and client stakeholders through lightweight, frequent touchpoints designed to capture improvement opportunities. Customize and control the frequency of touchpoints to align with the needs of any project. With EMPA, you'll surface risks earlier, identify blind spots more consistently, and serve clients more effectively. You select a touchpoint cadence for your projects. EMPA delivers micro-assessments for each consultant. EMPA aggregates assessment data into leading and lagging KPIs. EMPA generates contextual insight reports to enable better decision making at each level of leadership. Where are the biggest risks in my portfolio and how can I mitigate them? What accounts offer the best chance for me to win more deals? How skilled is my team and what gaps could impact our delivery? What am I doing well and what are my growth opportunities? EMPA will amplify your effectiveness, guaranteed. © 2016-2017. All rights reserved. Made with in Seattle, WA.